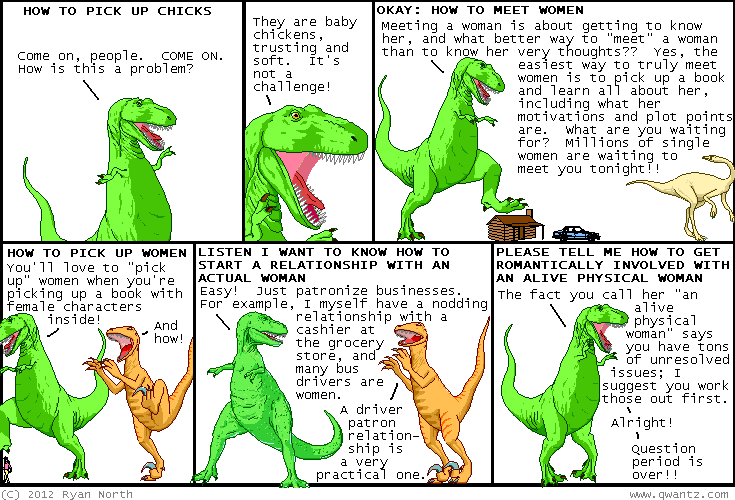 Dinosaur Comics - November 29th, 2012 - awesome fun times! November 29th, 2012: It has been a week since my Kickstarter launched and it's gone really well! If you haven't checked it out yet, I think you should; I think you will be pleasantly surprised. Also since we're playing through the book in the updates, you can also read some for free every day! WHAT A DEAL. Yesterday we unlocked the prequel book, Poor Yorick, as an actual physical book too, so now if you're getting the physical book you're also getting a second book for free, plus digital versions, plus digital Dinosaur Comics books too. It's KINDA INSANE.